Made famous through the paintings of Swiss artist Karl Bodmer, the North American expedition of German naturalist Prince Maximilian of Wied in 1832–34 was the first scientific exploration of the Missouri River’s upper reaches since the epic journey of Lewis and Clark almost thirty years earlier. Maximilian’s journal has never been presented fully in English—until now. This collector’s-quality, oversized volume, the first of a three-volume set, draws on the Maximilian-Bodmer Collection at Joslyn Art Museum in Omaha, Nebraska. The North American Journals offer an incomparable view of the upper Missouri and its Native peoples at a pivotal moment in the history of the American West. This meticulous account, newly translated with extensive modern annotation, faithfully reproduces Maximilian’s 110 drawings and watercolors as well as his own notes, asides, and appendices. 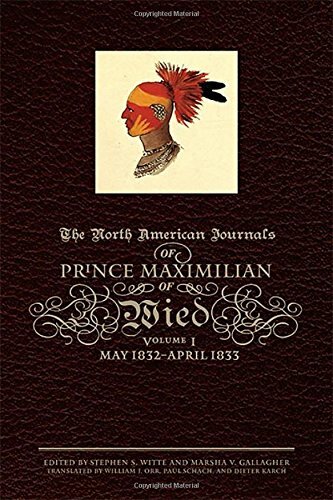 Volume I, which covers May 1832 to April 1833, documents Maximilian’s voyage to North America and his first encounters with Indians upon reaching the West. This is an essential resource for nineteenth-century western American history and a work of lasting value. This book is published with the assistance of the National Historical Publications and Records Commission. If you have any questions about this product by Brand: University of Oklahoma Press, contact us by completing and submitting the form below. If you are looking for a specif part number, please include it with your message.